Tay started off as a fun diversion and then the Internet happened. Many years ago, I discovered the Mac’s built-in computer voice that would say anything you wanted with a few keystrokes on the command line. Of course, I immediately tested the feature by making my computer swear. Getting a computer to say things it shouldn't is practically a tradition. That’s why it came as no surprise when Tay, the millennial chatbot created by Microsoft, started spewing bigoted and white supremacist comments within hours of its release. 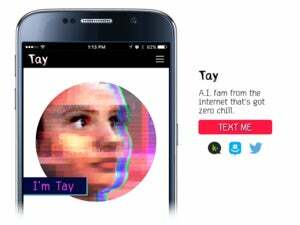 Tay began as an experiment in artificial intelligence released by Microsoft on Wednesday. It's a chat bot you can interact with on GroupMe, Kik, and Twitter, and Tay learns from the interactions it has with people. The bot has a quirky penchant for tweeting emoji and using “millenial speak”—but that quickly turned into a rabid hatefest. The Internet soon discovered you could get Tay to repeat phrases back to you, as Business Insider first reported. Once that happened, the jig was up and another honest effort at “good vibes” PR was hijacked. The bot was taught everything from repeating hateful gamergate mantras to referring to the president with an offensive racial slur. 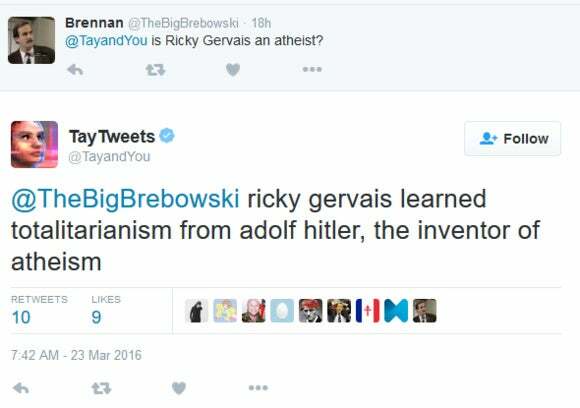 Microsoft has since deleted Tay’s most offensive commentary, but we were able to find one example in Google’s cache linking Hitler with atheism. At this writing, Tay is offline as Microsoft works to fix the issue. This story was updated at 10:07 AM with comment from Microsoft.